John Owen-Jones is playing the Phantom in the opening leg of the Phantom of the Opera Tour which was due to start previews at the Theatre Royal Plymouth last night. Having played The Phantom in London's West End he obviously knows his stuff as the Open Dress Rehearsal was cancelled for Saturday 25th Febuary saying the show will be going ahead as planned from Monday 27th February. 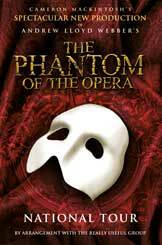 Another statement has just been issued: "Cameron Mackintosh regrets to announce the cancellation of the first preview performance of his new production of The Phantom of the Opera, originally scheduled for Monday 27th February. The size and complexity of the production which is being put together for the first time has necessitated more technical rehearsal time to fully integrate the company and set safely. Several large scenic elements can only be incorporated into the show for the first time on Monday morning. The first preview will now take place one day later on Tuesday 28th February at 7.30 pm. Ticket holders for Monday 27th will receive a full refund from their point of purchase and will also be offered the opportunity to attend a dress rehearsal as our guests on Tuesday 28th February at 2.00pm. Those wishing to attend this performance must collect a ticket from the box office in advance. We regret the disappointment and inconvenience this will inevitably cause but trust that the public will understand that in such a new, complex and spectacular production, safety is of paramount importance". Let’s hope they will be able to sort out the technical difficulties soon as I have heard fabulous things about this restaged Phantom.